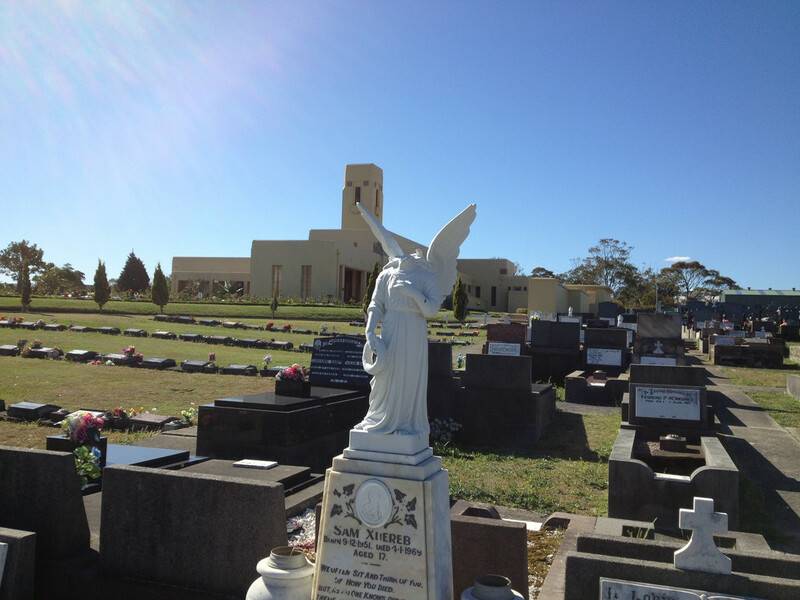 Eastern Suburbs Memorial Park Cemetery & Crematorium is an older cemetery in Eastern Sydney. 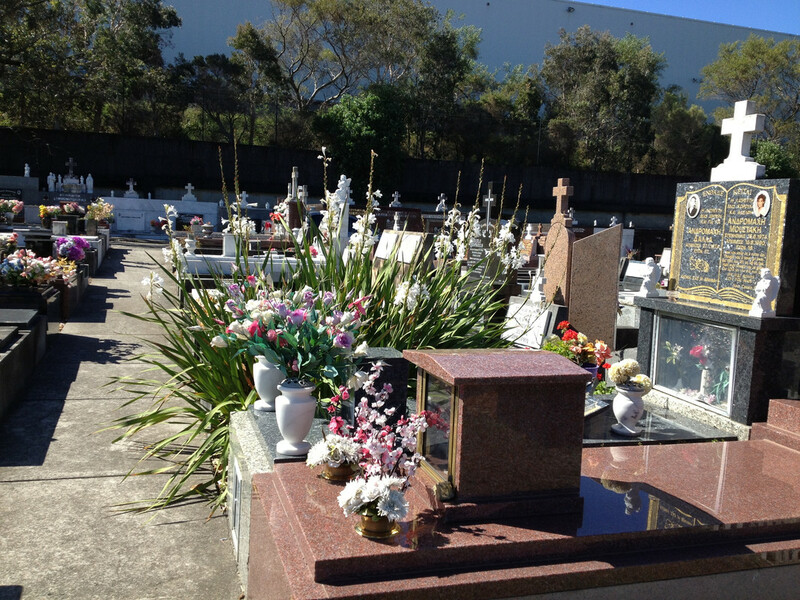 This cemetery is mostly focused on 'ethnic' cultures, so the graves tend to be rather colourful and diverse. 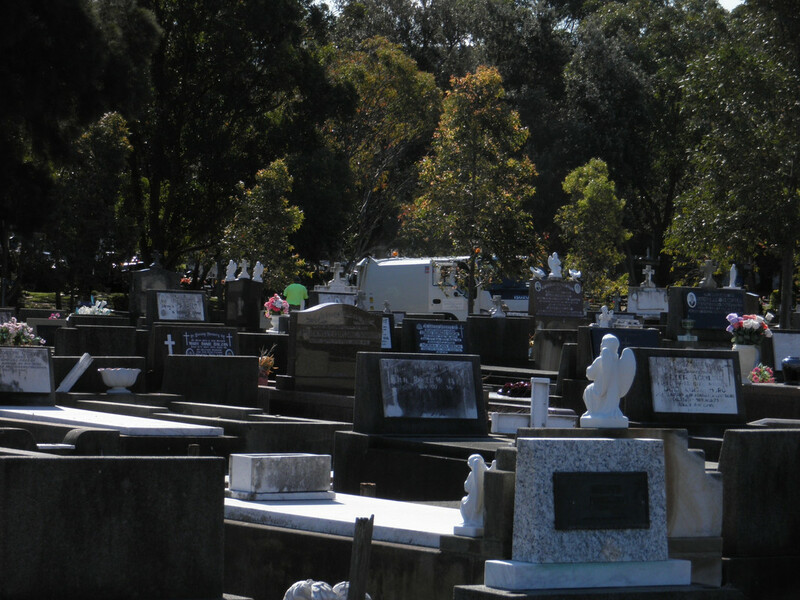 Of all the cemeteries in Sydney ESMP has the most variety of graves in one section. The more notable and unknown thing about it is the farm. 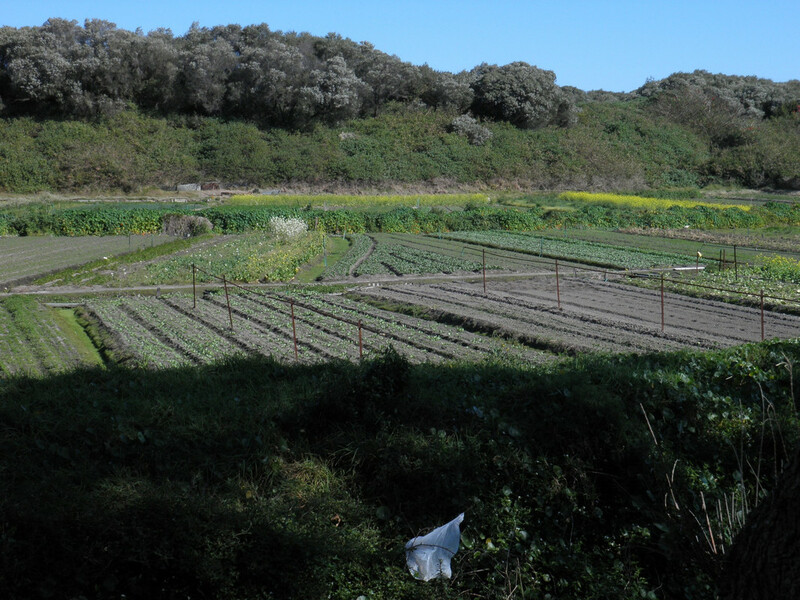 At the back of the cemetery, hidden behind a green fence there is a heritage Chinese farm. For more information about ESMP itself you can read my inside look of EMSP. You can view all of the photos shown here and more at this Postimage gallery. All photos were taken by me, and as such I encourage others to use them where and how they like. 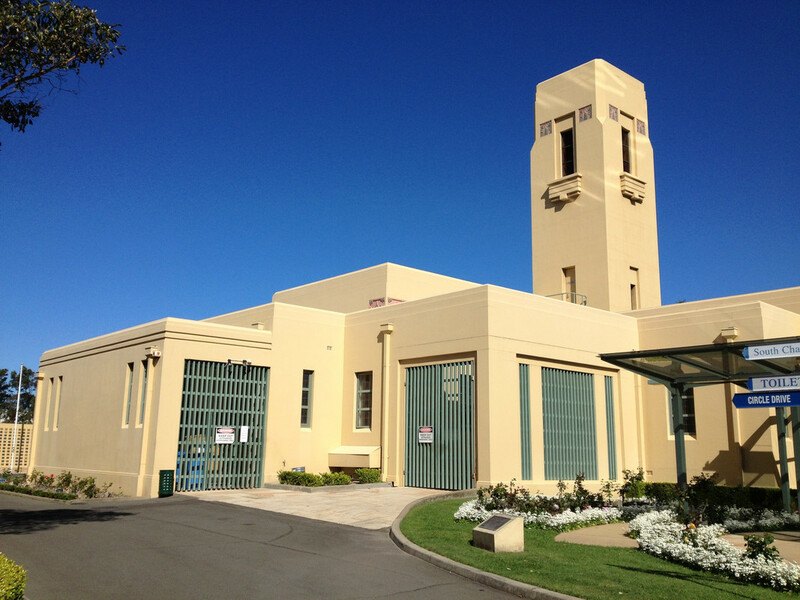 The main entrance to ESMP is on Military Rd, Matraville. There are two other entrances on Bunnerong Rd, but for simplicity this guide assumes you will be using the Military Rd gate. 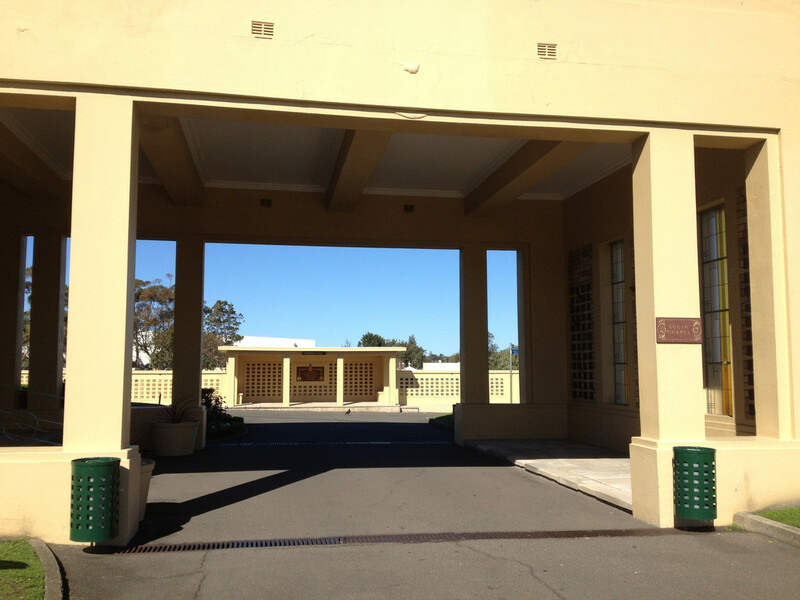 The Military Rd gate is more obvious and leads to all the main areas (such as the crematorium, office, funeral home, etc). This is a map to the office and cafe. 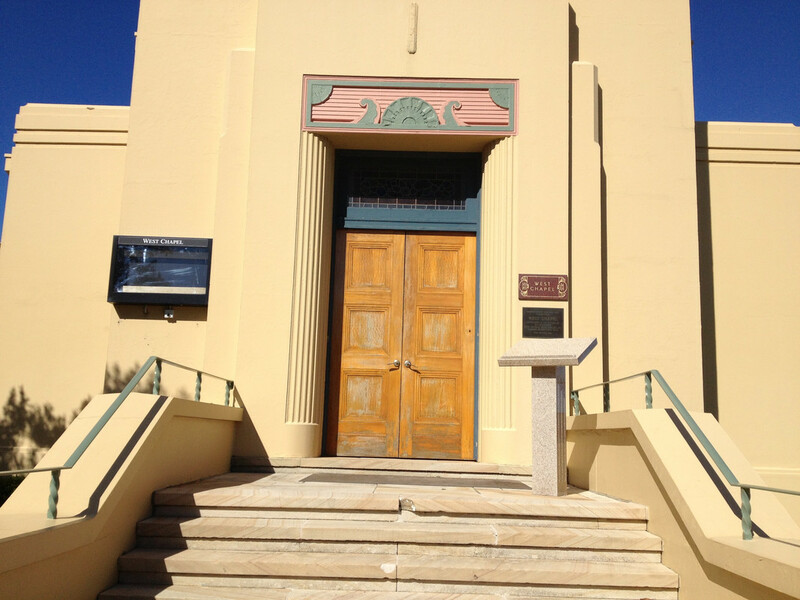 The office is located North of the marker, and the cafe is on the opposite side of the road. 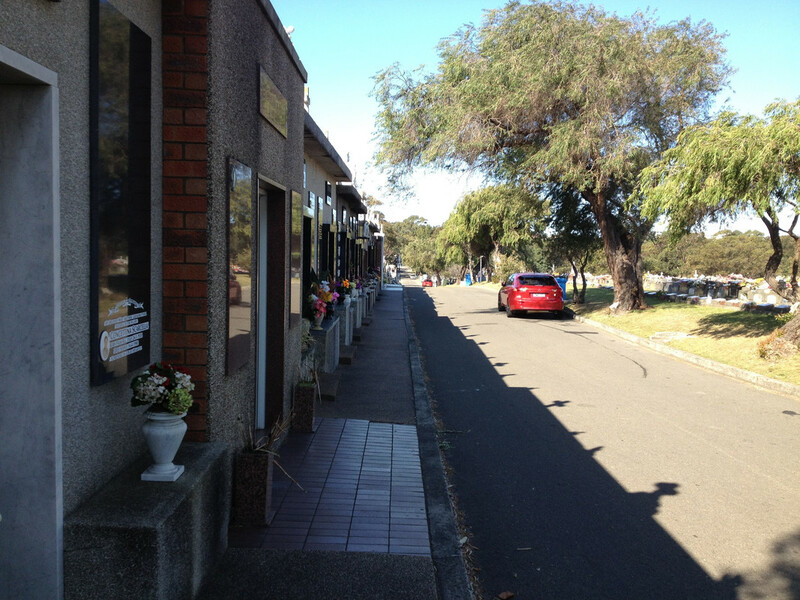 Most streets within the cemetery are easy to park in. There is space and it is not that busy. Yet there are several narrow streets, too narrow to park in safely. So just drive to the next street and there should be a place to park. 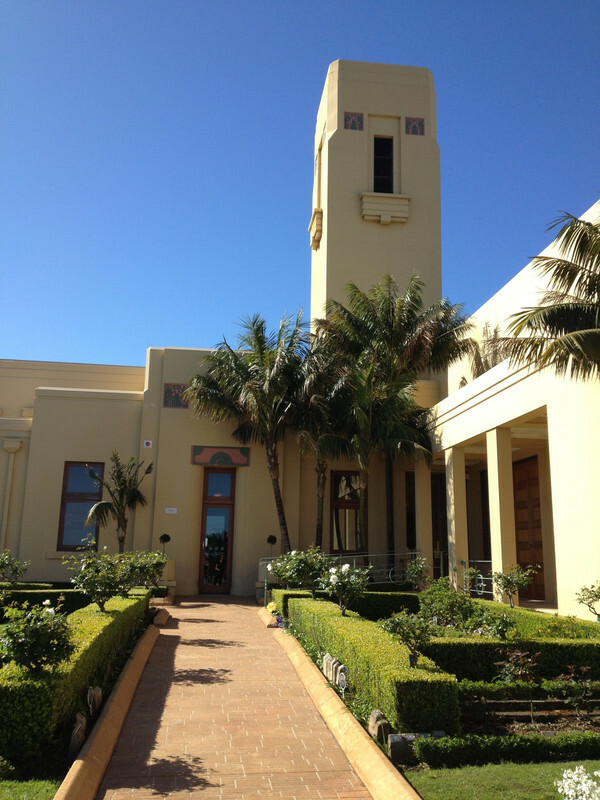 One of my favourite places to park is up by the mausoleum, on Frost Ave. This road has space to park, is shady and there is a lot to see right here (as I explain further below). Another favoured spot of mine is on Hotson Ave. It is shady here, and there is a lovely pond and garden nearby to have a snack in. I pull in off the road (there is a low gutter so it doesn't damage the car) and know my car won't block any workers or mourners. 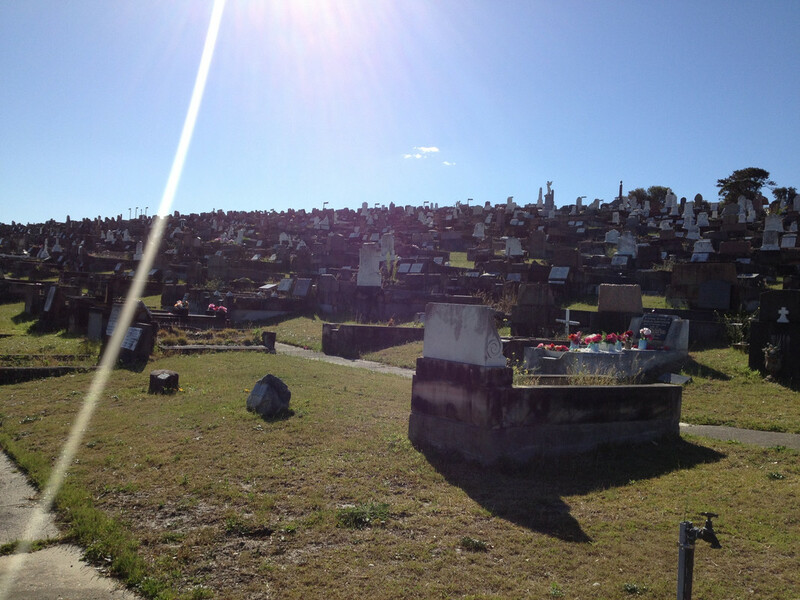 The final place I like in the cemetery is on Arthur Taylor Ave. It is by a beach and park, and out of the way. 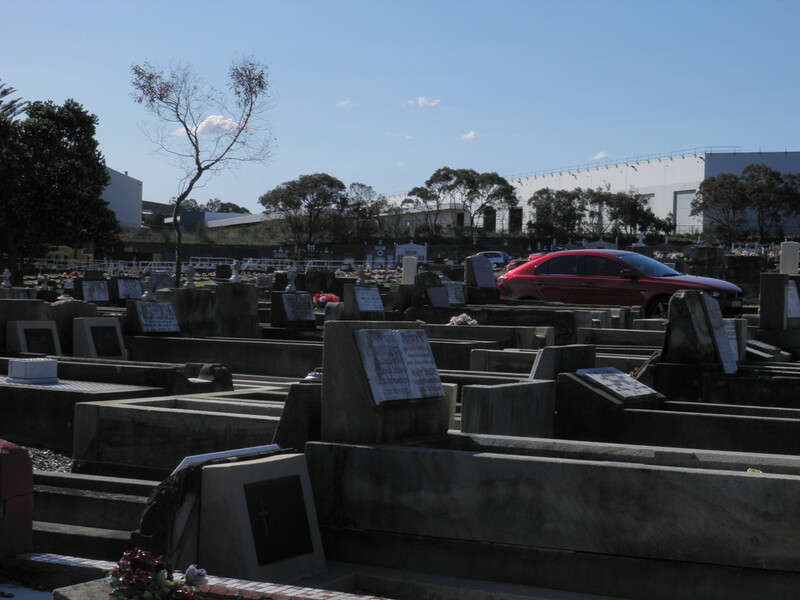 Parking outside the cemetery can be tricky. There is space to pull over by the gates on Bunnerong Rd. But it is an awkward space, not really meant to be parked in. 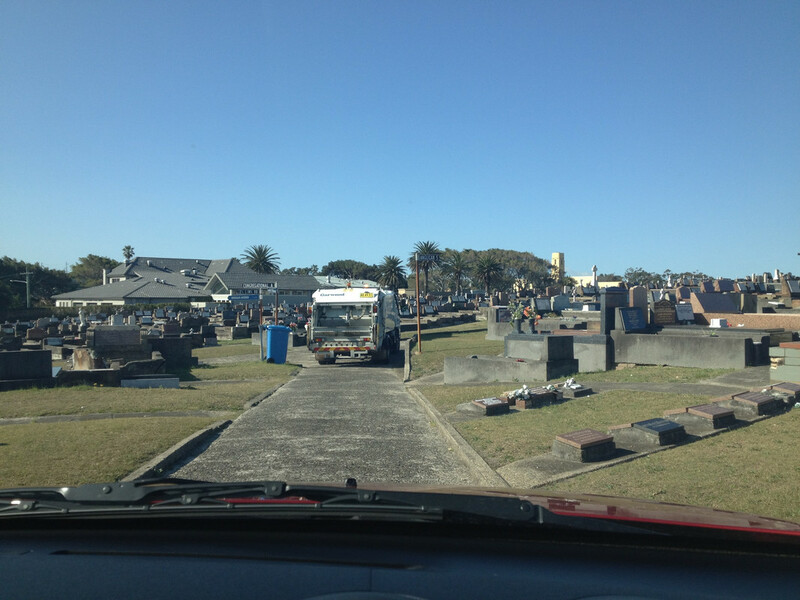 Military Rd has the best places to park outside the cemetery. But because all the main buildings are here it can get busy. 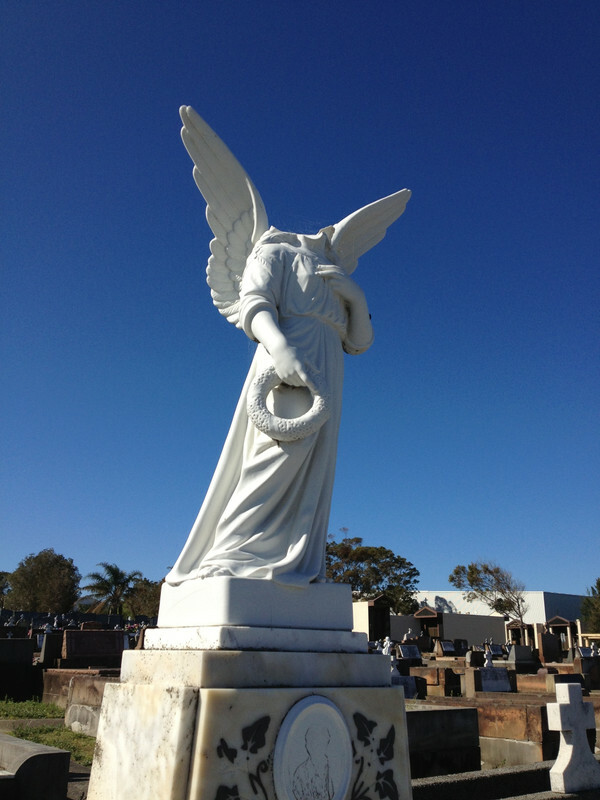 Headless statues are not uncommon in cemeteries. IMPORTANT -- You cannot drive behind the crematorium, well you can but you shouldn't. 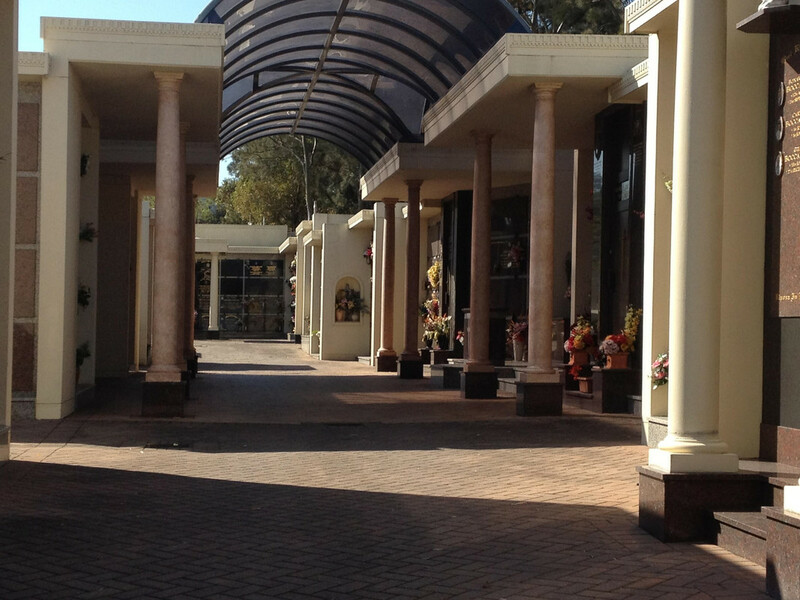 Driving past the crematorium chapels is reserved for authorised cars (such as funeral cars). All roads between point A and point B on this map are off limits. To drive along here might get in the way of a funeral. Anyone can walk along this path, just do not drive. To drive between the cemetery and crematorium car park take this route. 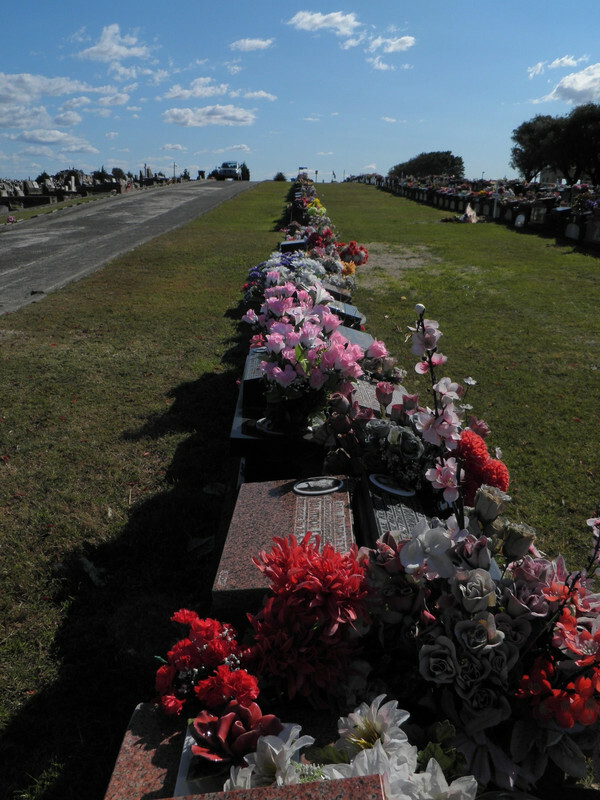 As always, think of the cemetery as a cross between a park and a beach. It is hot and sunny in summer and cold and windy in winter. In summer bring sunscreen and water. In winter bring a coat and umbrella. And always wear appropriate shoes. Although the ground at this cemetery is mostly even and solid. There is a cafe nearby, but no other shops. I take lunch with me as there are plenty of nice places for a picnic. 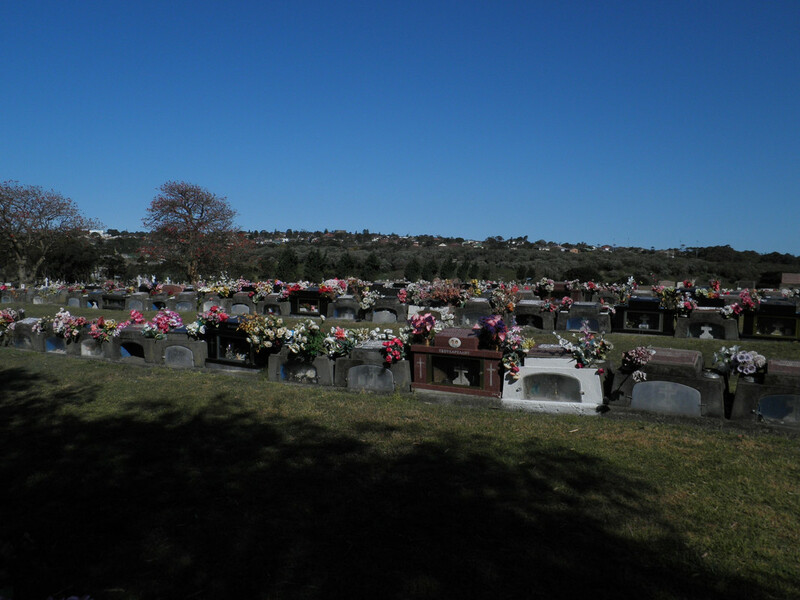 Within the cemetery there are many quiet and shady places. 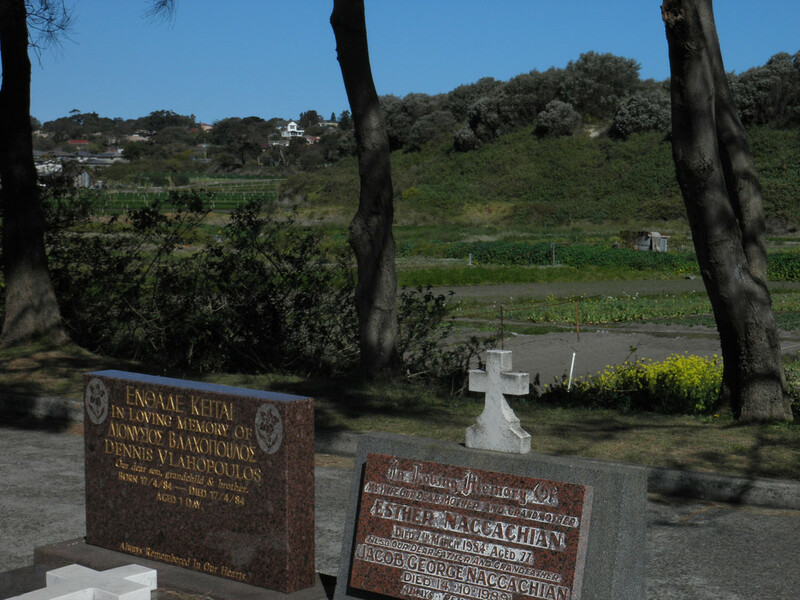 But there is also a beach and park right next to the cemetery. 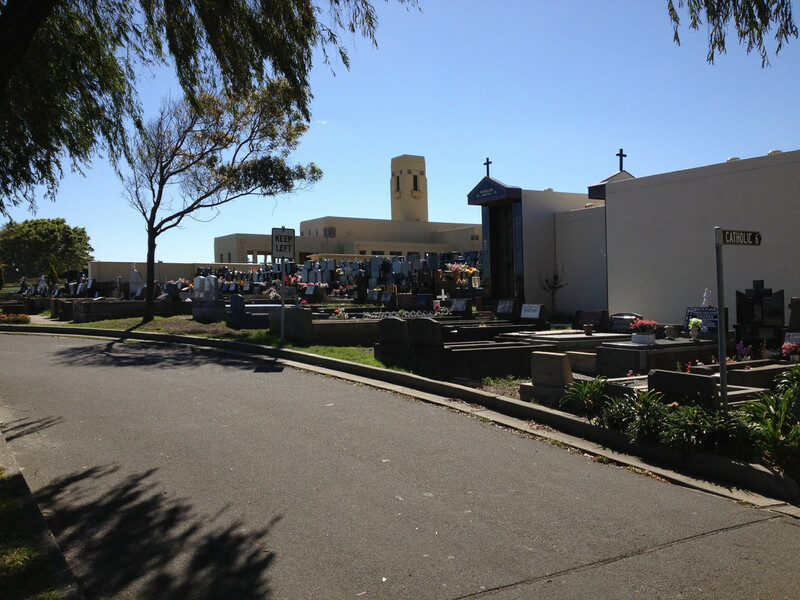 The walk from the cemetery to the beach takes about 5 minutes. Above all keep in mind that ESMP is a work site. There will always be trucks and staff moving about, doing important things. So don't block roads and keep out of their way. This guide assumes you start the driving tour at the main cemetery gate. 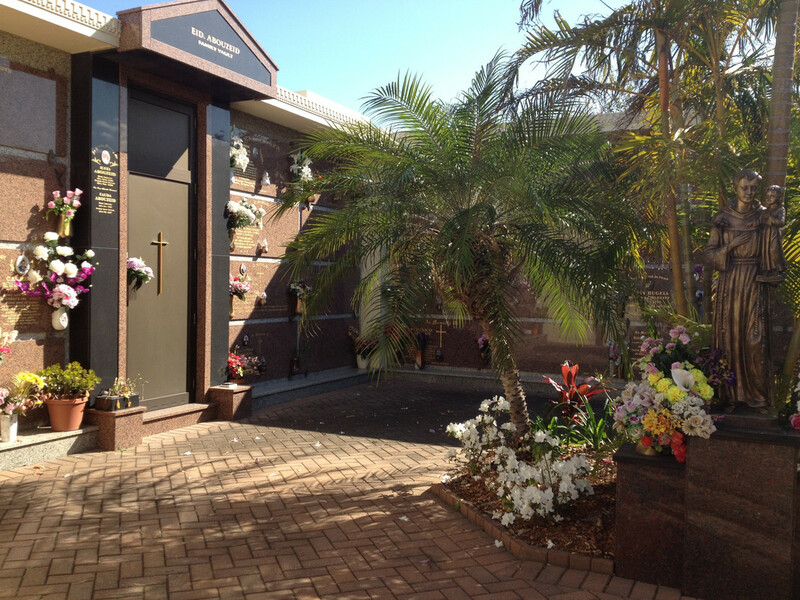 It is between the funeral home and crematorium, which makes it easy to spot. 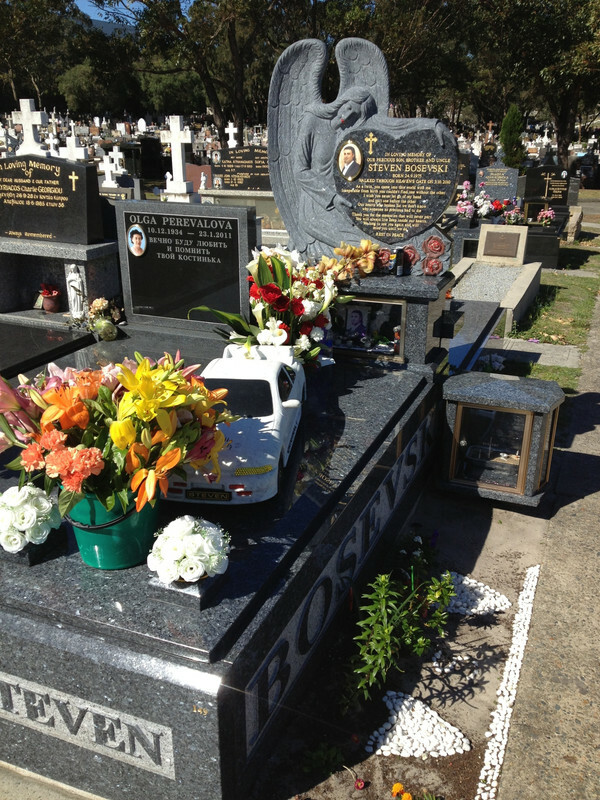 I start with the driving route as this is a large cemetery with good roads, so I recommend driving inside. It does not see everything, but will cover most of the notable areas in one go. The route should take 10 to 50 minutes depending on how fast you go, how often you stop and so on. I also strongly recommend going the direction shown in the map above. This direction should keep you from interfering with the grounds staff. There are a number of reasons this is the best direction. Most importantly because of the garbage truck, it is the way the garbage truck goes on the narrow streets. You do not want to meet this truck head on, there is no way past in and you will have to reverse down the narrow cemetery road. However if you go the way I suggest you will be behind it, not in front of it, on the narrow areas. Stuck behind a garbage truck. Nowhere to go but wait. Marker A - This is the starting point, there is a funeral home to the right (by the gate) and some interesting graves near it. However there is not too much to see around here. Marker B - To the left is the mausoleum, well worth a look and a walk through. 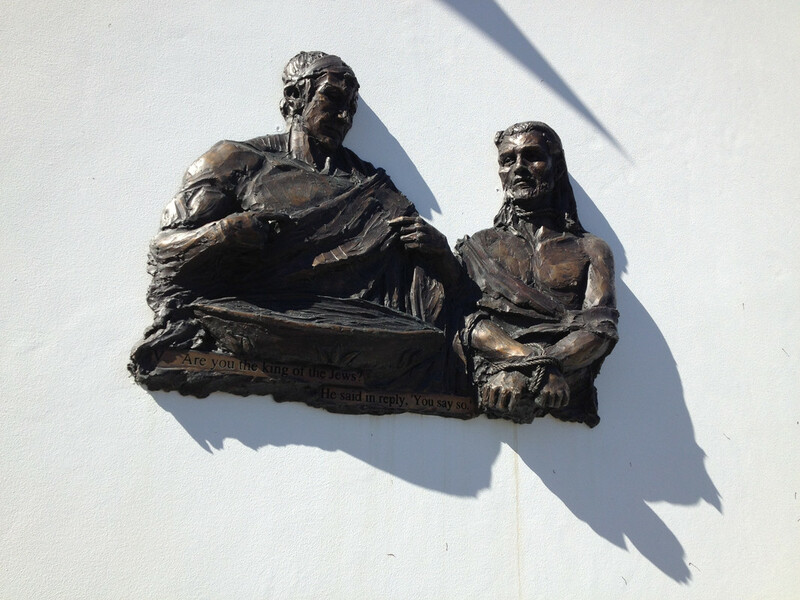 I find the statues and inscriptions a bit strange here. They are a little on the dark side, focusing on the sacrifice and suffering of Jesus. Have a look and see what I mean. To the right (South of the marker) is the child lawn along the road. Child lawns are always interesting and very different from the adult section. The child graves tend to have small headstones and use a lot more colour and child like things (such as torys, butterflies, etc). Marker C - Just to the right are some of the most interesting and unique graves I have found. There are two of note, the glass house and the stone car. But there are many other creative and different graves here. Walk around and explore this area, I find something new every time I go here. 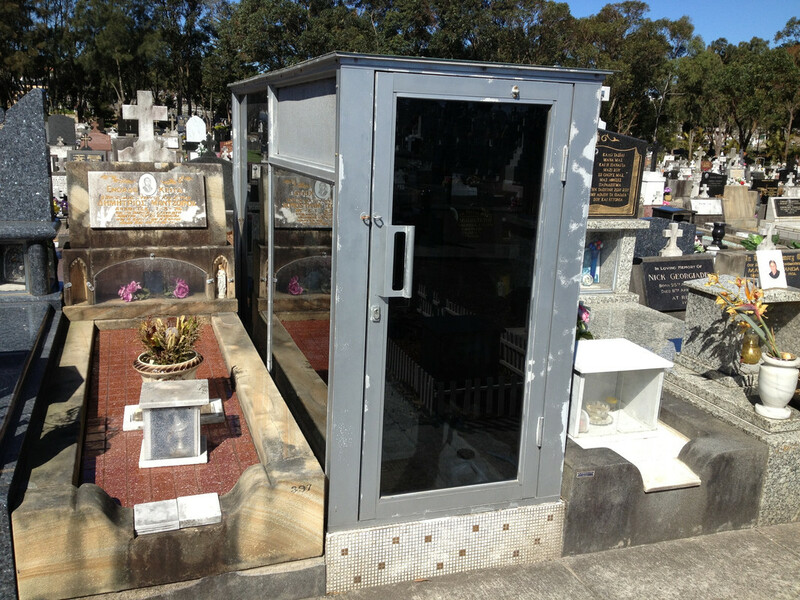 An incredibly different grave. I have seen nothing like it anywhere in Sydney. 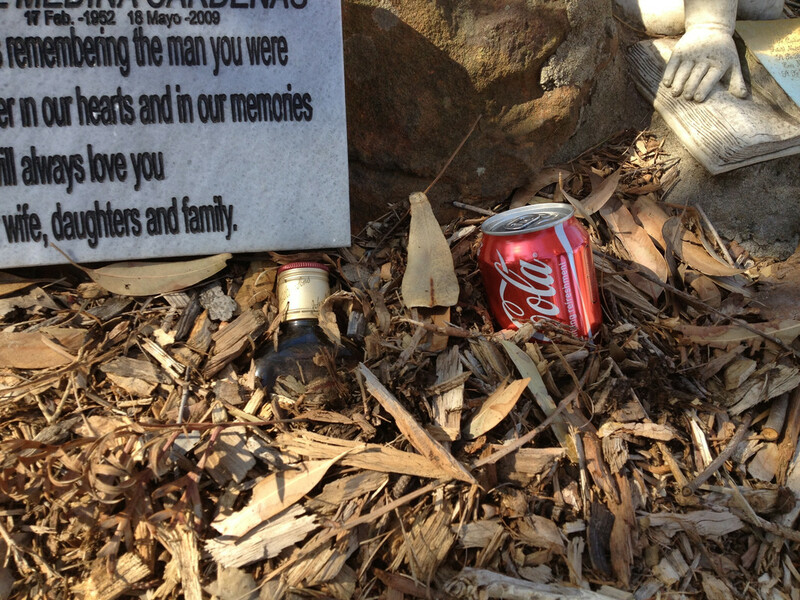 The grave marker is inside, along with flowers and cleaning tools. It appears as though it is looked after regularly. 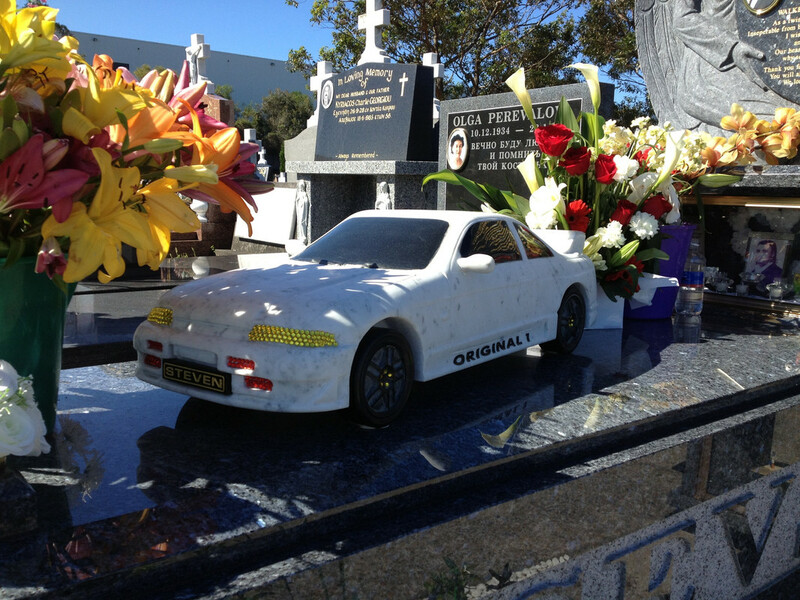 The car looks like it is stone with plastic jewels stuck to it. 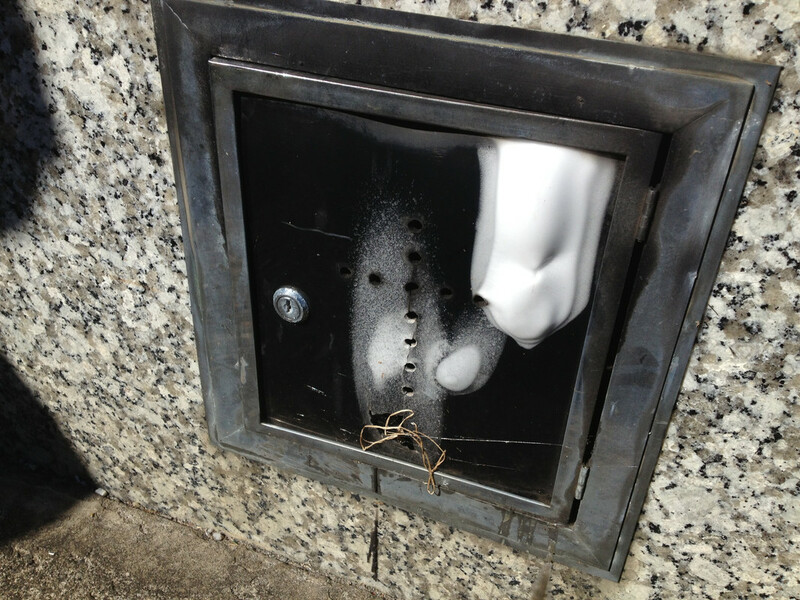 The angel on the gravestone also has plastic jewels stuck to it. the gravestones tend to also have a bit of colour. 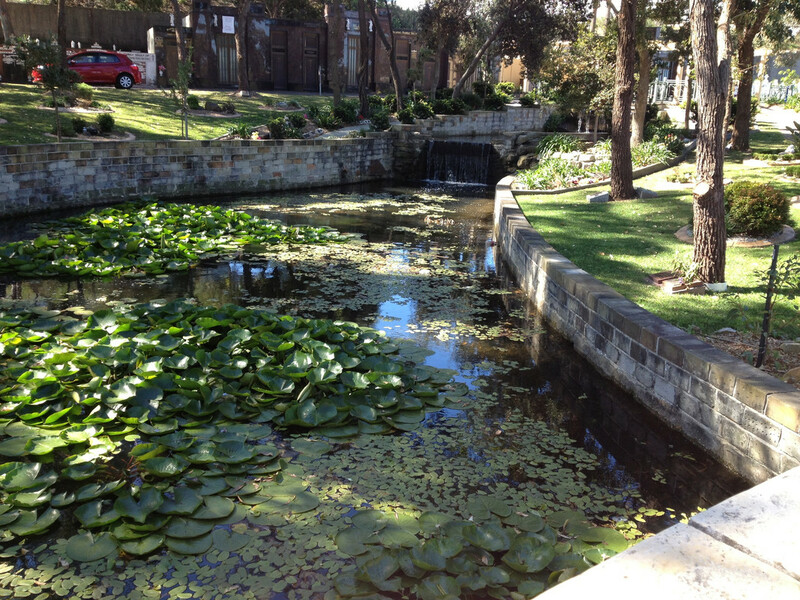 Marker D - This is a speed bump (which is not that bad) and a nice fountain and pond. You can often find gravediggers sitting around here, it is a very nice place to stop and relax for a bit. 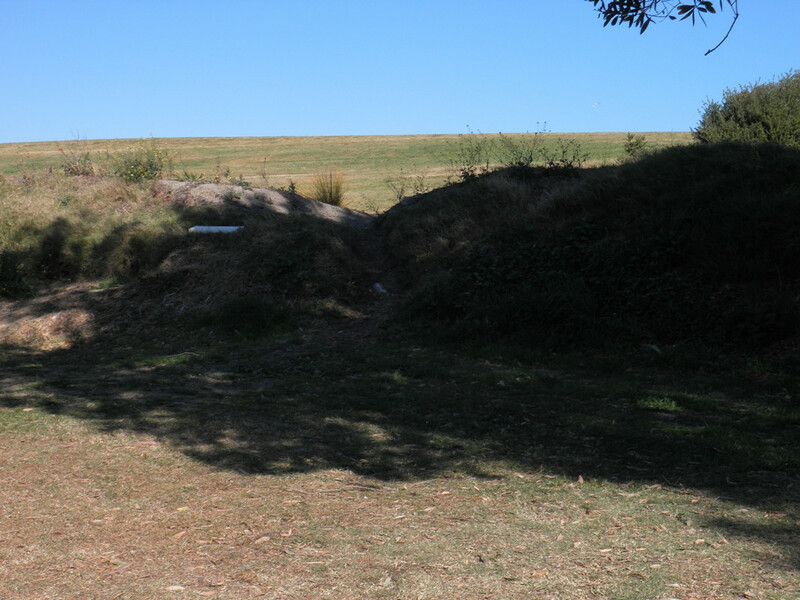 Marker E - The graves to the left (East of the marker) are very old, and very similar to some in Rookwood. 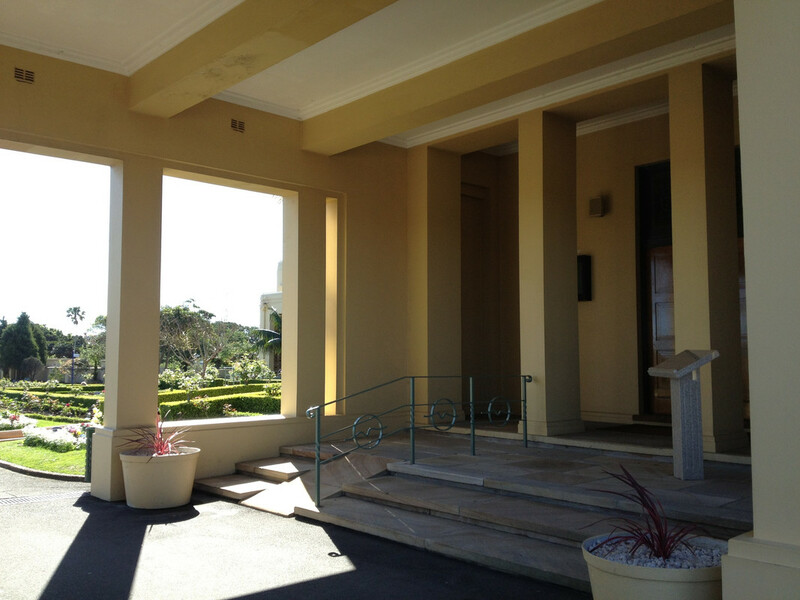 It was just surprising to find these here, it is looks like a bit of Rookwood got built in the wrong place. They are also arranged in a fun pattern, as you can see on google maps. 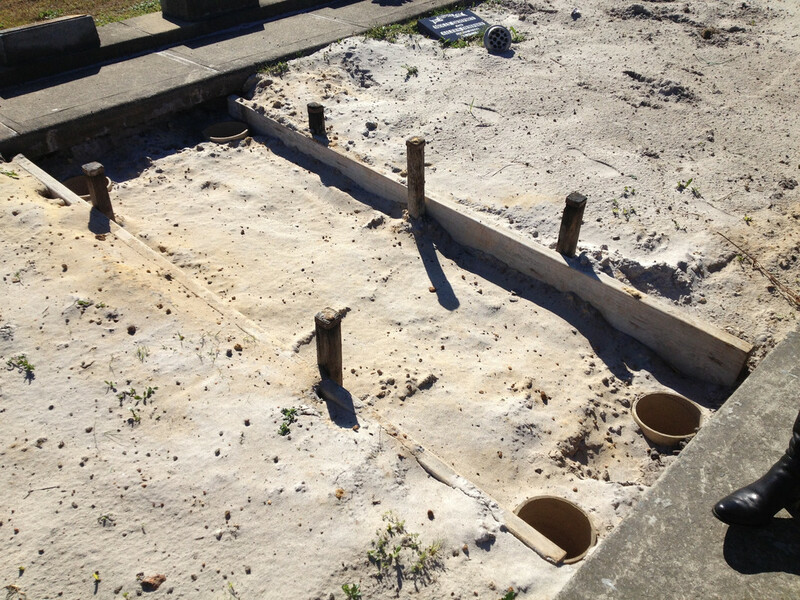 About to put in the foundations for a monumental grave. Marker F - To the left (South of the marker) are some interesting and older graves. 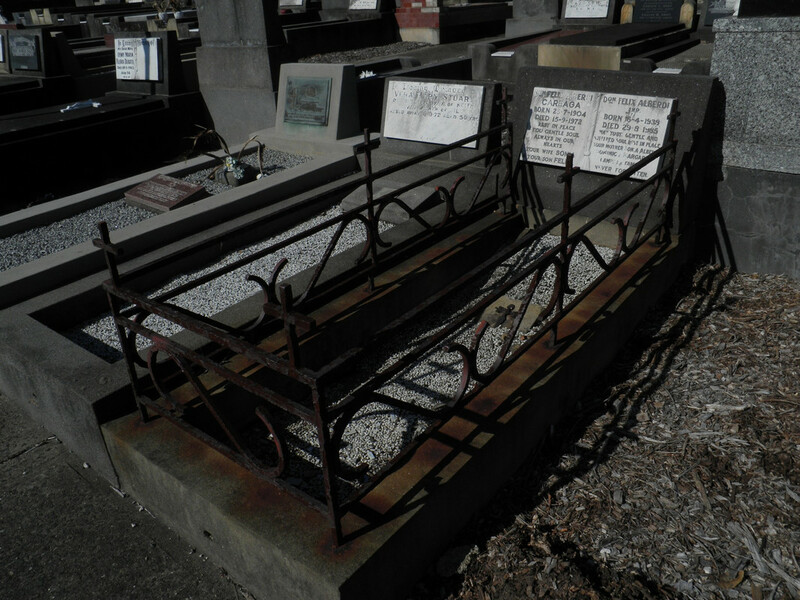 There are small angels and other such details on some of the graves. Marker G - This is the best spot to stop and relax for a bit. 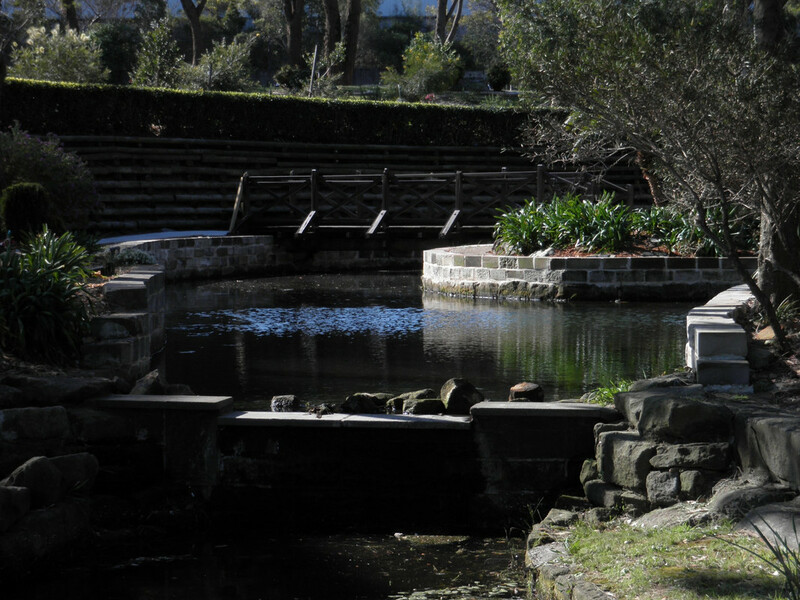 There's a gazebo and gardens to the left and a pond and gardens to the right. Which makes it a nice and peaceful spot. It also makes it a great place for some pictures. 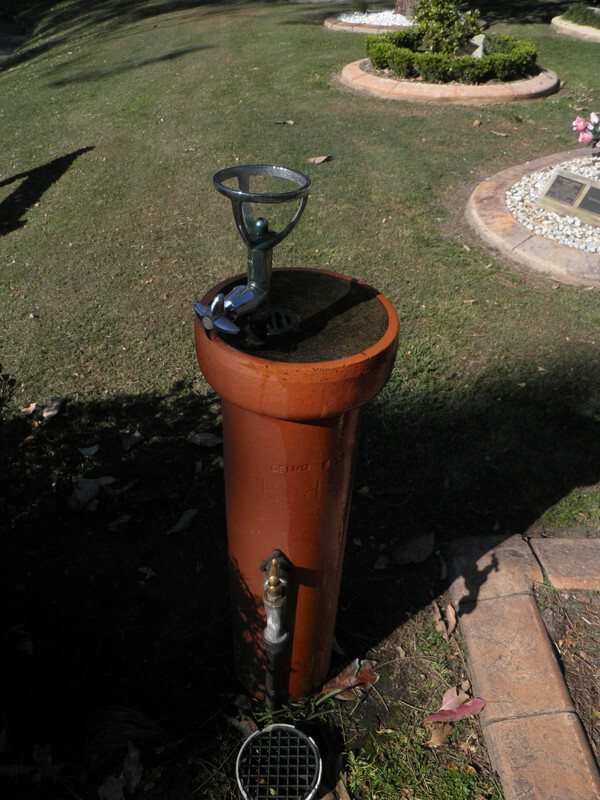 There is a bubbler in the gardens to the left (just South of the marker). Perfect if you forgot top bring water and are thirsty. Marker H - From here you can finally see the Chinese Farms. These farms are historically listed and make for great scenery from the cemetery. Unfortunately ESMP wants the farm gone, so they have fenced up most views of it. But from here you can see the main farm building and some of the fields. 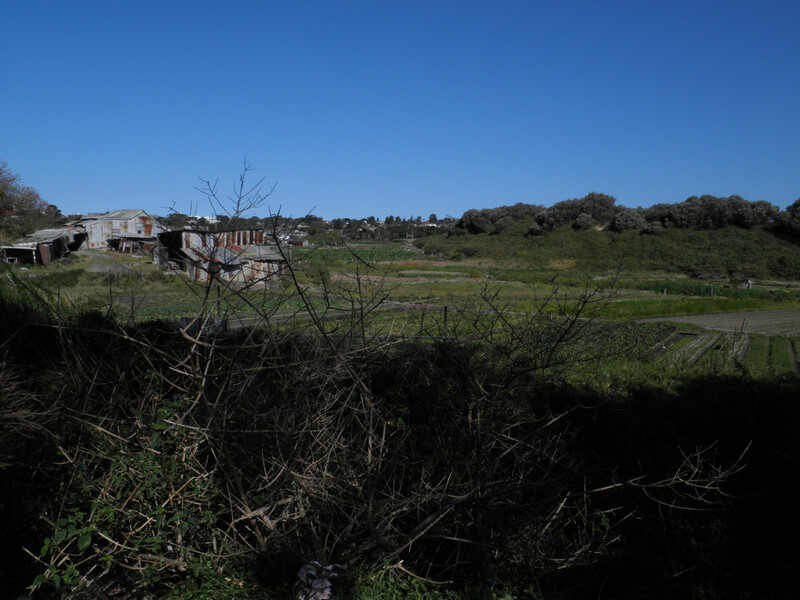 View of the Chinese Farm from the cemetery. The main building is just to the left of the picture. Marker I - This is another good spot to see the farm from. 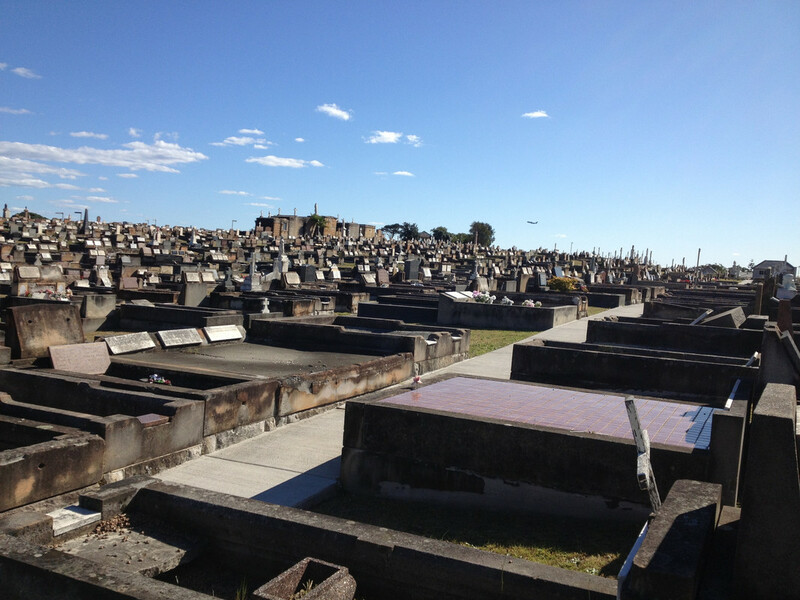 But there's also a good view of the cemetery just on the other side. Marker J - Here is a great place to park and see the beach. 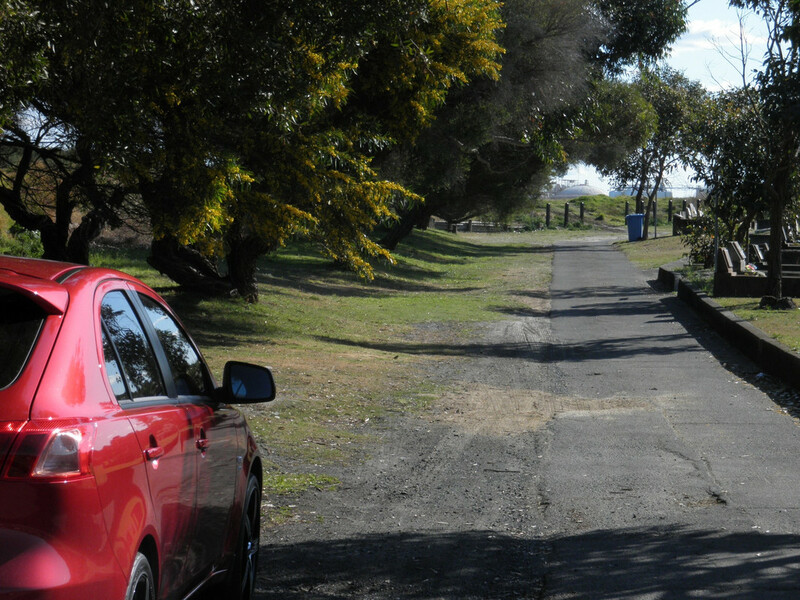 The road has plenty of trees, so the car will be in the shade all day. There are some paths between the cemetery road and the park road. The walk is quick and easy, making this another good place to stop and rest. A long and wide road to park on. This is what the path looks like in a lot of place, just go with it. 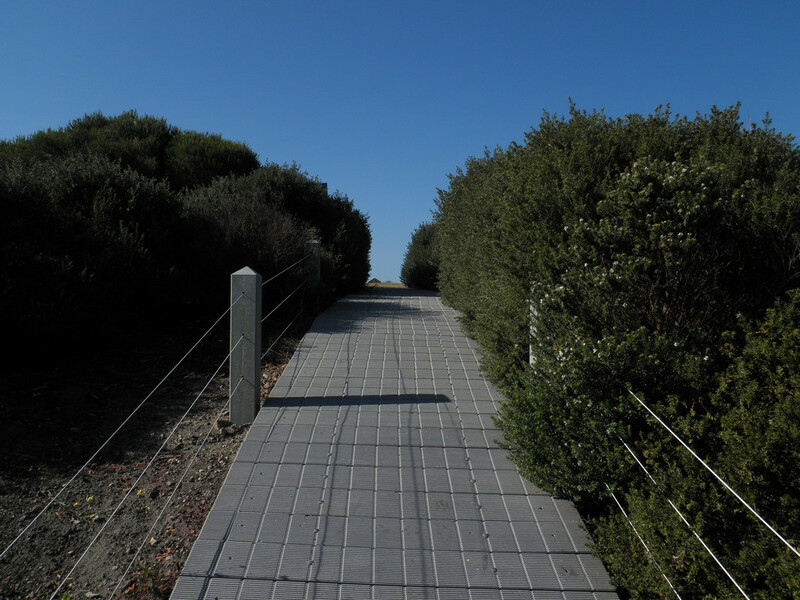 Walkway between the park and beach. 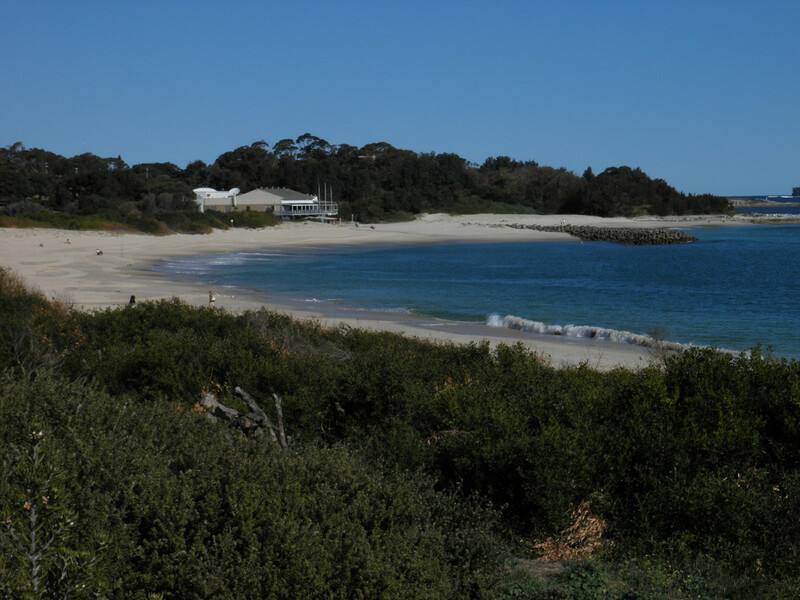 The beach, only 5 minutes walk from the cemetery. Marker K - Another place to park when going to the beach. There is more parking here, but there is no shade. 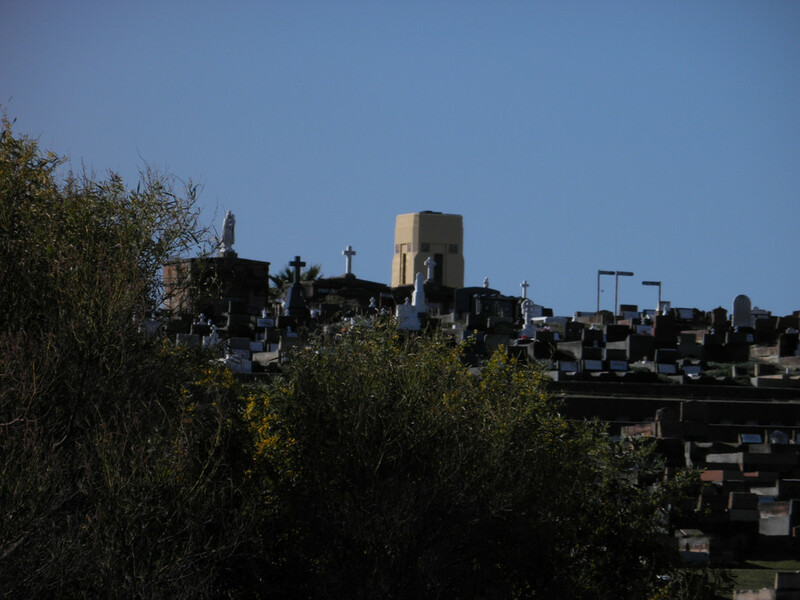 View of the cemetery from the park, you can just see the crematorium. Marker L - This is not a particularly interesting point, it is simply the end. 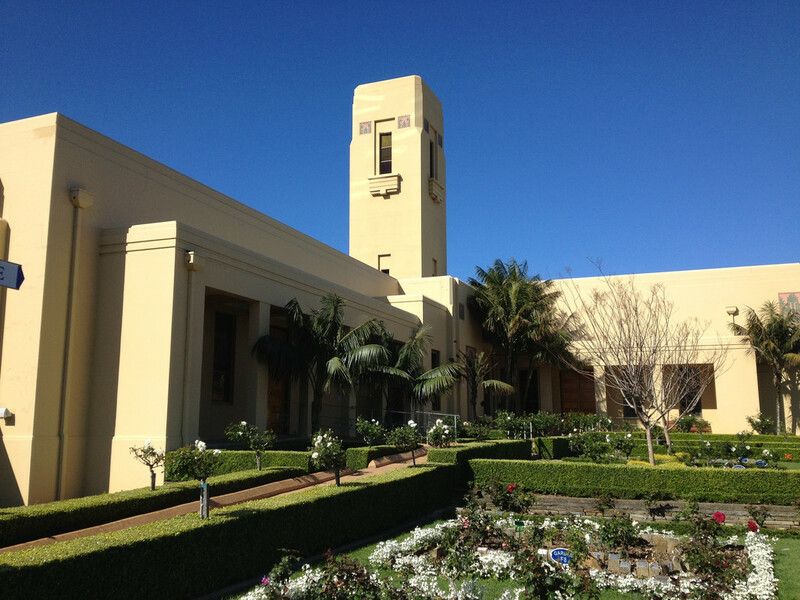 The crematorium was opened in 1938. 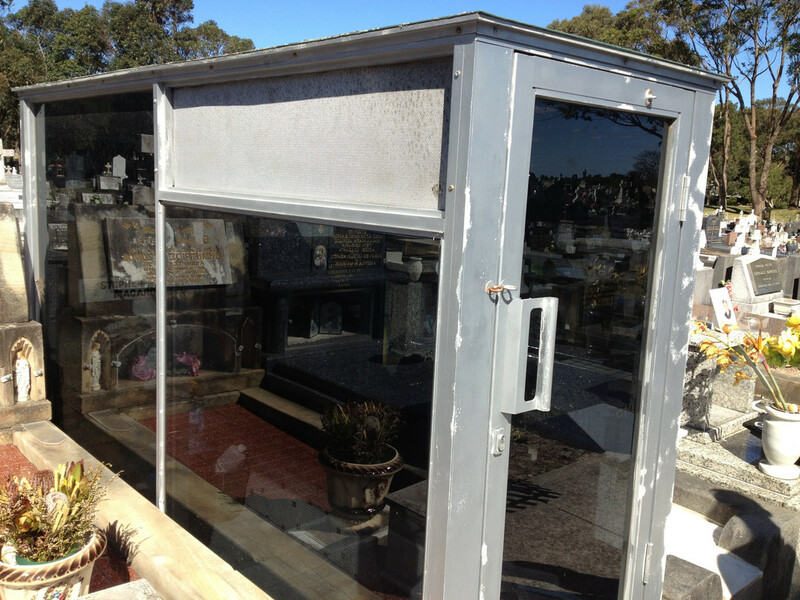 Australia saw a boom in cremation around this time, so a few crematoriums were built and dedicated to WWI and WWII veterans. You can find many WWI memorials around this crematorium. This is the route I recommend around the crematorium -- it is best to park and walk this. It is a quick but rewarding walk. In total it should take no more than 20 minutes even at a slow pace with lots of stops. Marker A - This is the starting point, in the crematorium car park. On google maps it looks like a construction site, but it is definitely finished and open. 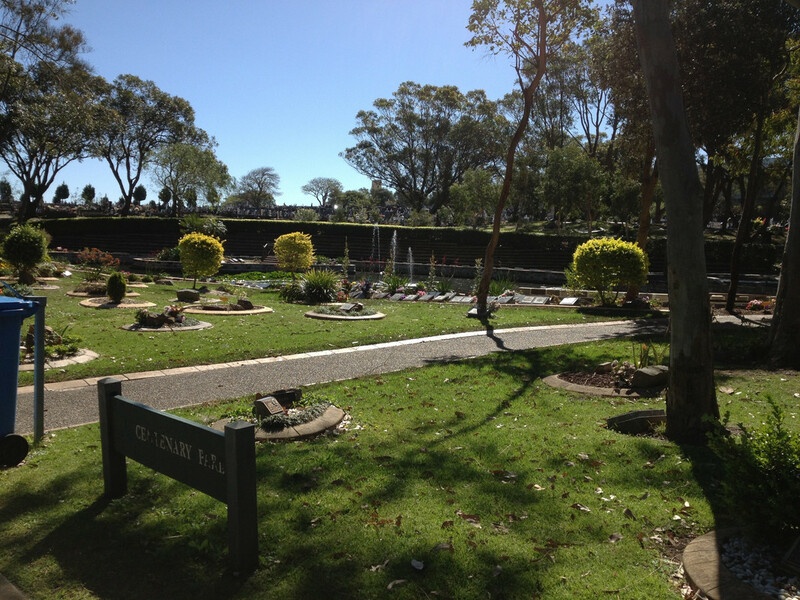 Marker B - Here is an interesting little area, with some memorial gardens and the mausoleum nearby. Marker C - This is the entrance to the crematorium. Remember, only authorised cars can drive beyond this point. You will need to continue on foot. 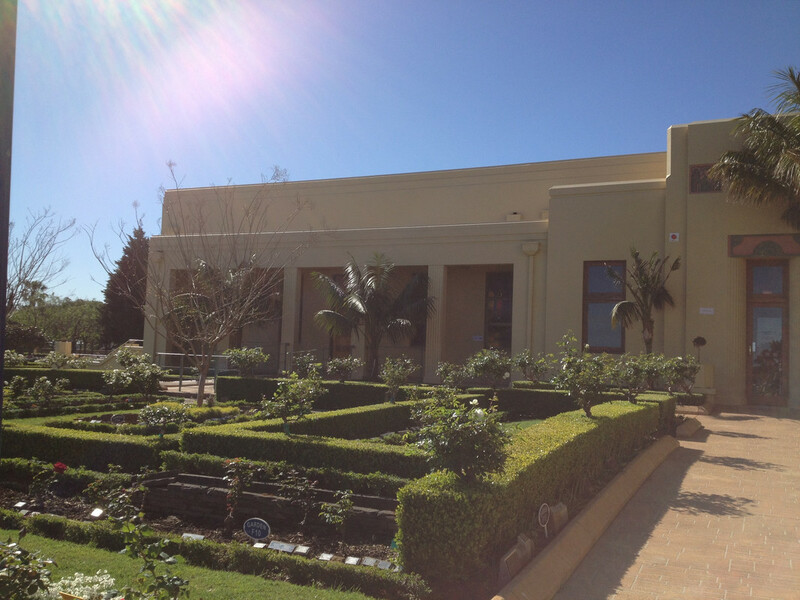 Just before the entrance is a small gazebo and gardens. 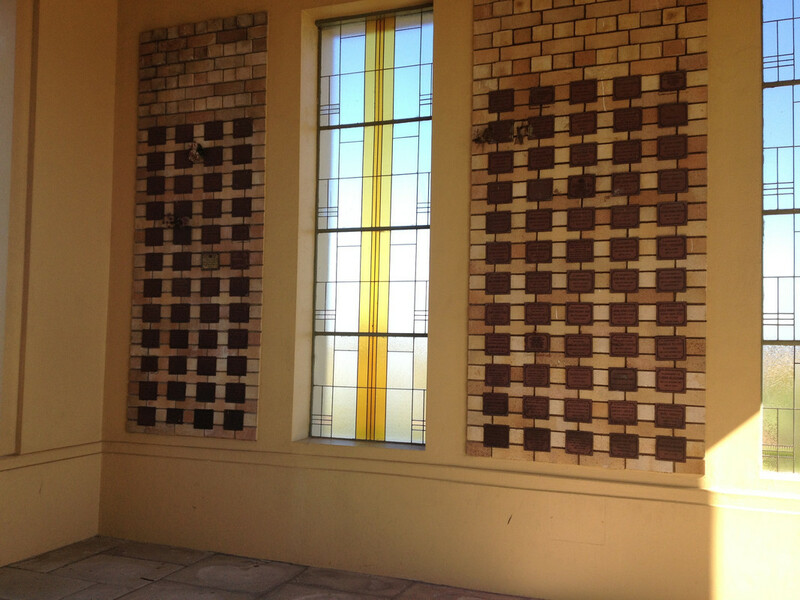 It is quite nice here and a great place to take pictures of the crematorium. Directly ahead (South of the marker) is a waiting area, there are seats and shade. Here is a nice place to stop and rest for a bit or just to take photos. 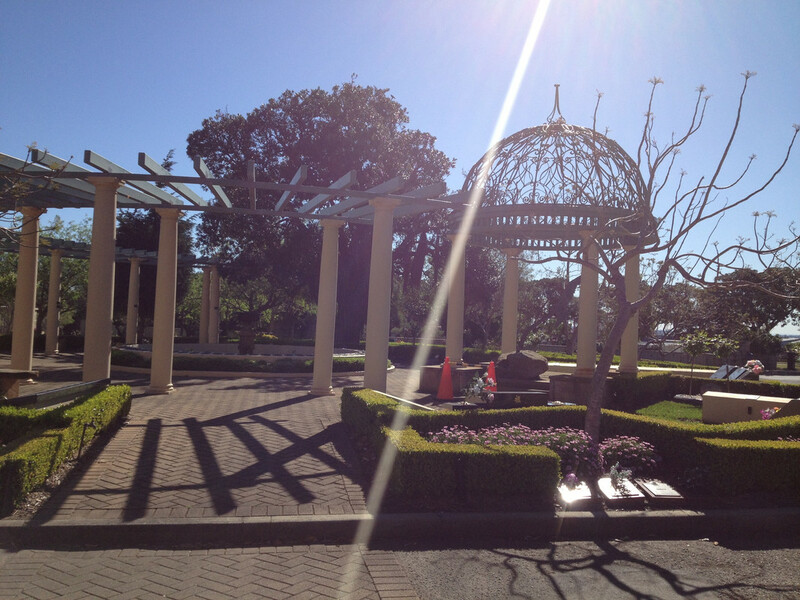 The gazebo by the entrance. Marker D - This is the East Chapel. 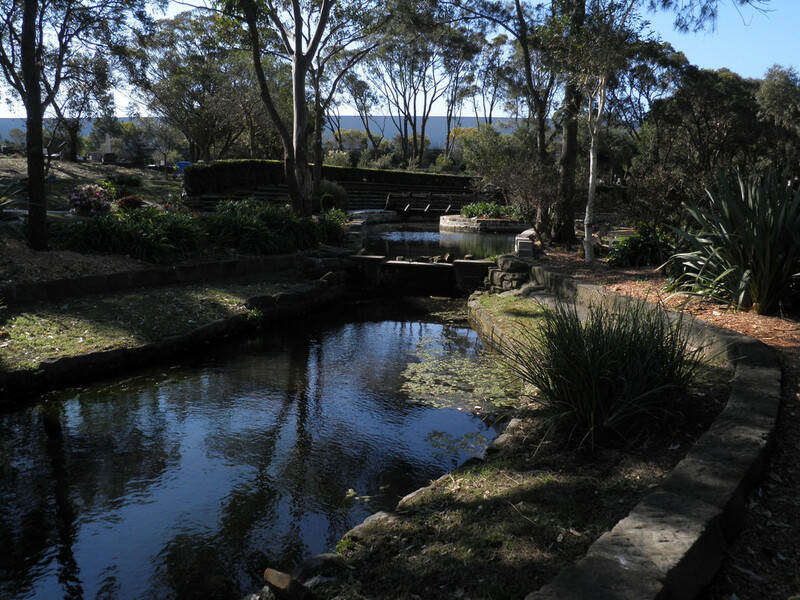 It has a good view of the gardens and cafe to the East. 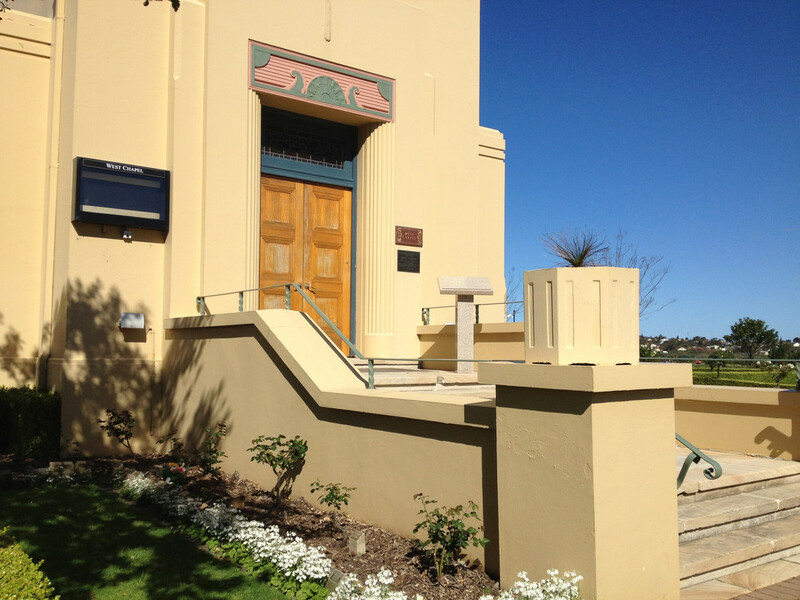 Between marker D and E there is a nice garden and the ESMP office. You can get some good pictures here, and assistance from staff if needed. Marker E - This is the South Chapel, the only one with cover over the door. 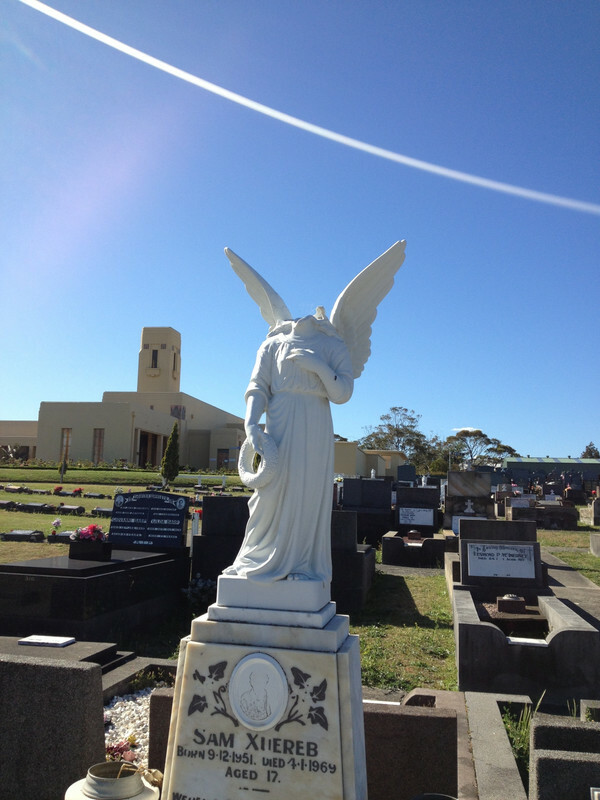 You can get wonderful photos of the cemetery from here.